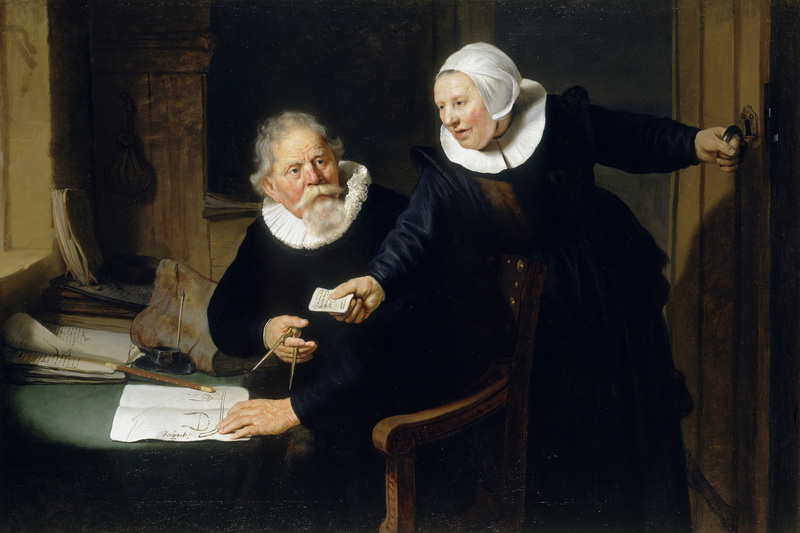 “The very top of the middle class” can be seen in the above 1663 masterpiece, “The Shipbuilder and his Wife.” The shipbuilder, Jan Rijcksen, an investor in the Dutch East India Company, was so well-off that he could afford to commission a portrait by the most fashionable painter in Amsterdam: Rembrandt van Rijn. 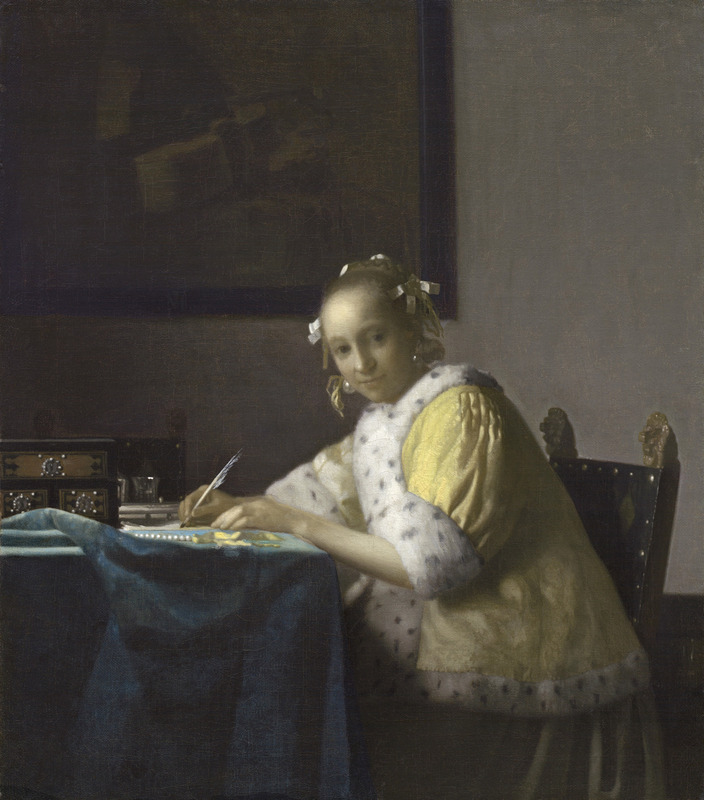 In the painting, Rijcksen is receiving an urgent letter from his wife, Griet Jans. 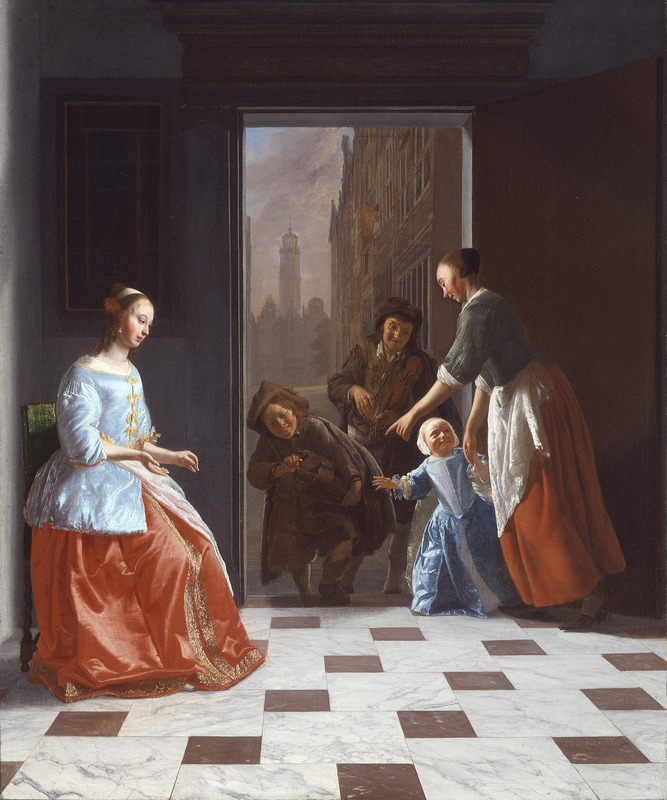 Another indication of Dutch wealth was women’s ability to become full-time housewives. 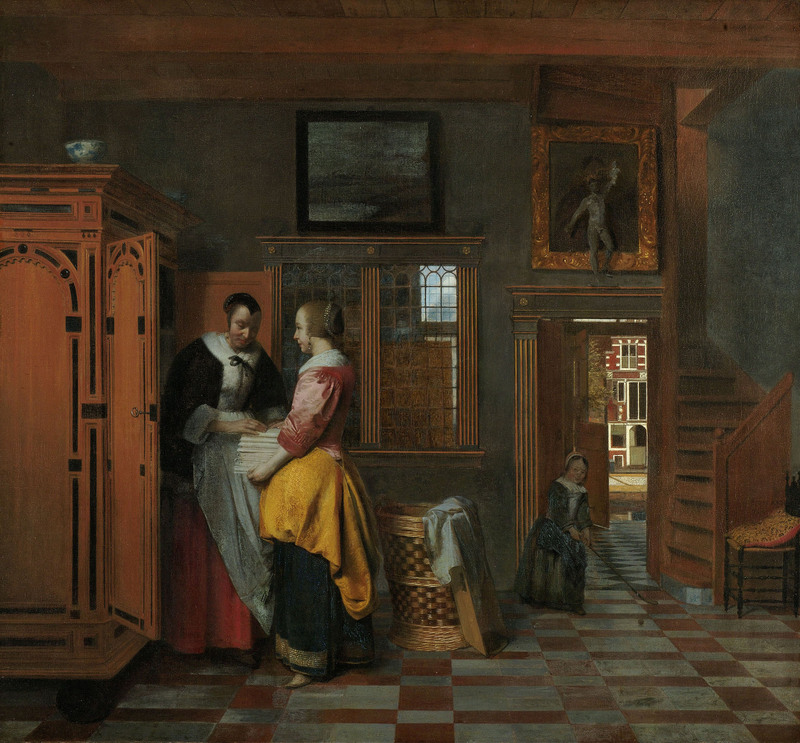 Pieter de Hooch’s 1663 painting above, “Interior with Women beside a Linen Cupboard,” emphasized the linen cabinet, often the most expensive piece of furniture in the middle-class home. The woman in the fur collar (left) is showing her daughter how to care for the family’s prized linens. As middle-class women gained their independence, some worked out of their homes, for example, making lace for sale; widows were also allowed to take over their late husband’s shops. 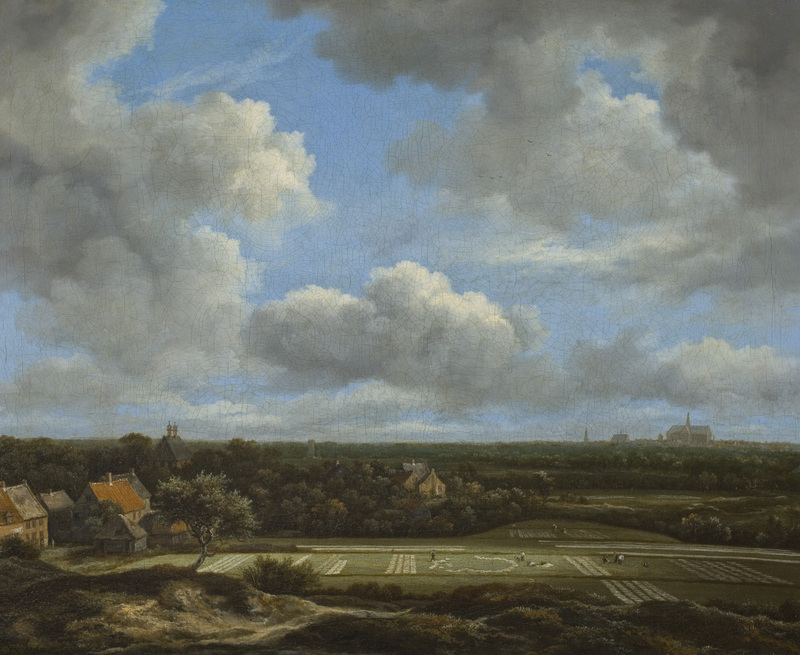 Dutch cattle produced more milk than anywhere in Europe and were often proudly depicted in paintings. 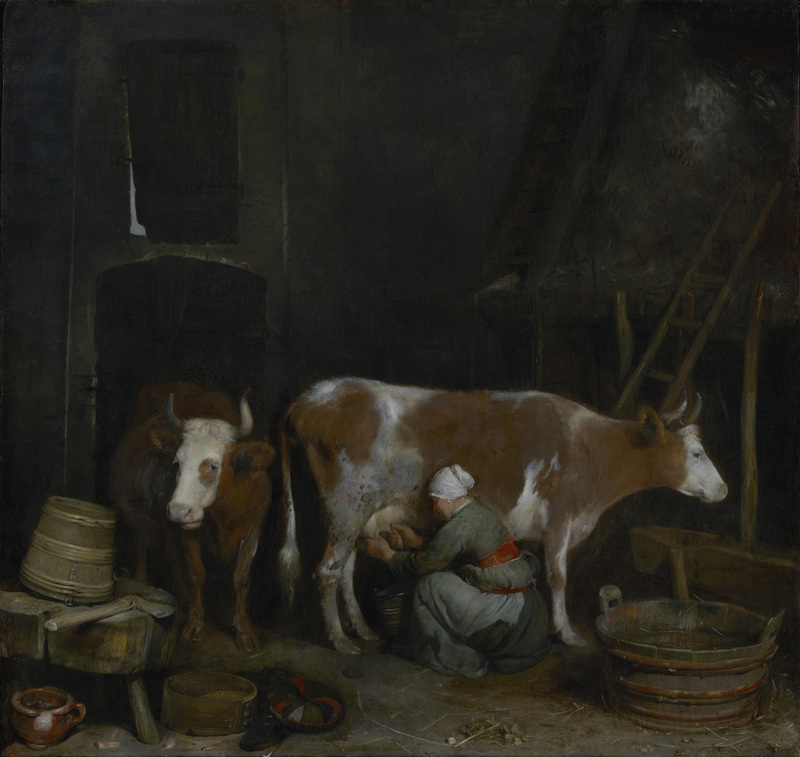 Milking cows was a low-status job, however, and the woman in “A Maid Milking a Cow in a Barn” (above) by Gerard ter Borch in 1652-54 was probably either a farmer’s wife or a wage-earning maid who extracted milk for the domestic butter industry or cheese exporters. Moralizing was popular in Dutch paintings. 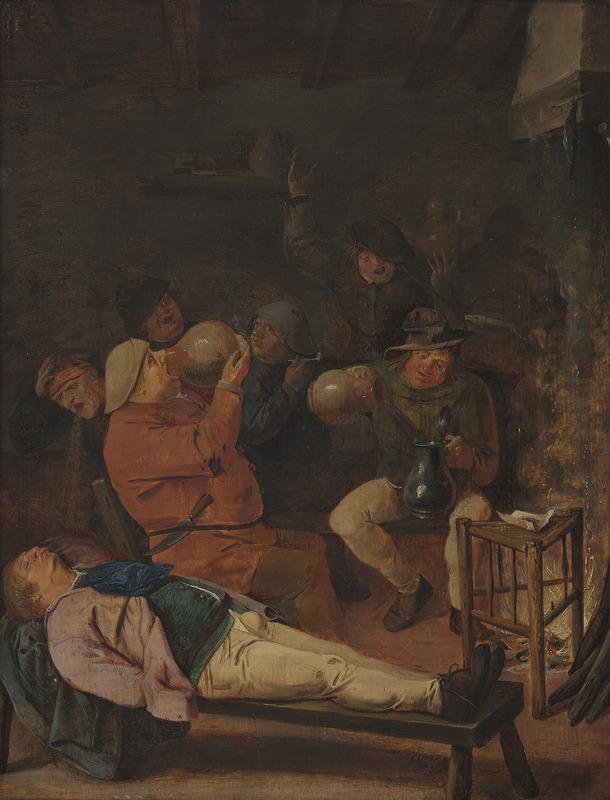 Indigent men in “Interior of an Inn,” by Adriaen Brouwer in 1630, are shown guzzling beer or are either asleep and snoring or vomiting. Paintings with themes of sloth and gluttony appealed to wealthy and educated buyers, according to the exhibit. Fascinating “pictorial” commentary on the economic distinctions of another place and time. Thank you! This is a treat for those of us who are not able to get to the museum in person. The explanations are great as they are not readily evident (to me) a few centuries later. I read every posting Squared Away does. In fact I shared one last week on my Facebook page. You are doing valuable work on the financial ramifications of retirement in the U.S. at Boston College. (I am a graduate of Newton, ’69) Continue the work. I hope to visit this show next week when I am in Boston for Christmas. Beautiful images which demand thought from the viewer.